A few pictures of sea kayaking around the Channel Islands, mostly from about 30 years ago or slightly older. The difference in shape of the images is because the earlier ones were taken with a Kodak Instamatic camera (remember those?) before I had a job which paid enough money to be able to buy a 35mm camera. In all the time that we spent paddling around the Channel Islands in the 1970’s and 80’s I don’t think we ever bumped into any other sea kayakers, it really did feel like an era of exploration. This is returning to Jersey (visible behind the paddlers) from Sark in June 1979. Note the old style of Henderson screw hatches. Another image from the Sark paddle in 1979, in those days the only sea kayak which we considered having was a Nordkapp HM. If you could afford it you had Lendal Nordkapp paddles with wooden blades, if not you just used your standard Wild Water paddles. Heading north from Jersey, the island is Sark, which was our original destination but we changed part of the way across and decided to go to Guernsey instead. The paddler is Derek Hairon who now runs Jersey Kayak Adventures. Arrival at Bordeaux in Guernsey on our day trip from Jersey. What had planned to be a gentle paddle turned into a 40 nautical mile day trip. In the distance can be seen Herm (left), Jethou (right) and Sark just visible between the two. On the return journey we stopped off at Herm to phone through to our parents to let them know that we were going to be late home and the telephone box still had buttons A and B to press. The summer of 1982, I was getting married and so distant holidays were out of the question but we had a great two weeks paddling around the Channel Islands. This is Port au Moulin on the west coast of Sark in August 1982. Havre Gosselin, on the west coast of Sark This was on an Advanced Sea Assessment in May 1983. The Nordkapp HM still dominated the kayaks in use in the Channel Islands. This photograph was used on the front cover of Canoeist Magazine. Leaving Creux Harbour, Sark in December 1983. We left Greve de Lecq, on the north coast of Jersey, in the dark and crossed the 12 nautical miles to Sark. The idea was to purchase duty free drink for Christmas and we had a significant number of orders. Unfortunately the shops were shut so that part of the paddle failed. We did managed to find a toasted cheese sandwich before returning to Jersey and landing back at Greve in the dark. In the 1980’s I was busy running lots of training and assessment courses for the BCU Senior Instructor Award. This was December 1983 on the south coast of Guernsey. The paddler in blue is Ron Moore, a superb coach and legendary speaker who was based in Plymouth, who is sadly no longer with us. Another BCU training course in October 1984. This is at Havelet, just south of St Peter Port. Plastic kayaks had made an appearance, although Brian Aplin is still paddling what looks like a fibre glass KW7. It was Brian who I accompanied on his swim a couple of months ago, from Lihou to the Hanois. The Minquiers in September 1985. We visited this reef to the south of Jersey as a day trip whilst training for the Canoe Club paddle we were planning for the following summer when we kayaked from Tromso to Honnigsvag, around Nordkapp. In the 1980’s I ran a canoeing (kayaking) school in Jersey but we used to do lots of trips away. This is crossing from Guernsey to Herm in perfect conditions in July 1989. 1989 saw the arrival of the Aleut II, designed a built by Howard Jeffs. I still have this kayak. It opened up a number of possibilities. Pete Scott and myself attempted to paddle around the Channel Islands but it also meant that some people could undertake paddles that they might not have done on their own. This is two of the younger Club members heading down the east coast of Sark in June 1990. I think this was still a Senior Instructor course, we hadn’t quite become Level 3 coaches. This is launching down the steep slipway in Saints Bay Guernsey in October 1990. I was amazed that we survived all these courses because nobody had heard of risk assessments etc. What I do remember was that there was always a huge element of fun. 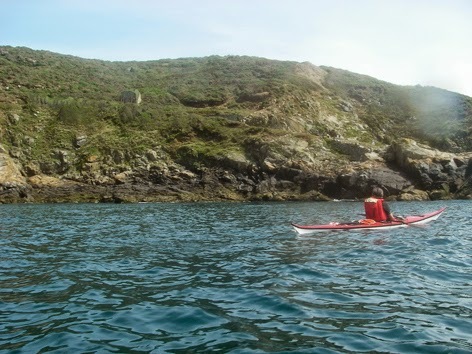 Sark is one of the truly special sea kayaking destinations and this weekend we were fortunate enough to be able to complete a circumnavigation of Sark in all almost perfect conditions. 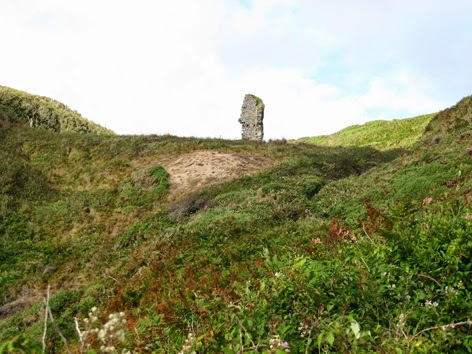 Parts of the island have been covered in an earlier post in relation to Mervyn Peake and Sark but there is a lot more to the island. We launched from Dixcart Bay, a convenient bay on the east coast, which provides relatively easy access to the main facilities on the Island, via a wooded valley. The circumnavigation was clockwise meaning that we headed south first. Unusually there was very little swell so we were able to wander through the reefs and channels off the southern tip with relative ease. Possibly the most challenging, but also most rewarding, part of the circumnavigation is the area around the Gouilot Passage. To the west lies the privately owned island of Brecqhou, whilst to the east are the Gouilot Caves, through which the tide runs at quite a considerable pace. The ability to perform a hanging draw, in the semi darkness, is a vital skill in this area. To the north lie a variety of coastal erosion features such as the arch at Port au Moulin and the stacks at Les Autlets, interspersed with a huge number of caves, the presence of which were document by the Latrobe brothers in the early 20th century, a copy of their book is essential research for anybody exploring the coastline of Sark, by whatever means. Bec du Nez the most northerly point of the island was missed as it was possible to cut through a channel to the south of the headland. Heading south along the east coast we passed underneath Point Robert lighthouse before reaching Maseline Harbour. This was completed in 1948 and was designed to take larger vessels than the original harbour at Creux, in the hope of increasing the number of visitors.Creux Harbour lies just to the south of Maseline and was the original harbour. It was destroyed in the winter storms of 1865/66 so the present jetty dates back to 1868. We popped in for a quick visit, noticing the rack of sit on tops belonging to Adventure Sark, a specialist outdoor provider based on the Island. From here we threaded our way through some very narrow passages before arriving at Derrible Bay, the Creux, a distinctive geographical feature is at the back of the bay and a must visit location, particularly if the tide is in. Dixcart Bay is next, our starting point 8 miles earlier. A memorable 3 hours of sea kayaking behind us. The circumnavigation of Sark ticks all the boxes of a classic paddle. In the evening as we walked from the restaurant back to the campsite there was an intensity to the darkness which you don’t get in many places, which is why the island was awarded Dark Sky Status. The clarity and number of stars was quite exceptional. Just another reason to visit this sea kayaking heaven located about 12 miles north of Jersey. The view south from Dixcart Bay. L’Etac is the island offshore, that is the usual landfall when crossing from Jersey. Paddling through the cave, just to the north of La Coupee, the narrow bridge of land which joins Sark to Little Sark. Moie de Breniere, off the south east coast of the island. The whole of the coastline is pretty rugged, with easy access to the water only possible in a few places. Heading towards the Gouliot Passage. Brecqhou is the island to the left. The tides run up to 8 knots in this area. Looking across La Grande Greve towards La Coupee. Entering the Gouliot Caves, the tide was running north through the caves, with a speed which created some interesting conditions. Looking across the Gouliot Passage towards Brecqhou. Toby sitting under the arch at Port au Moulin. Creux Harbour on the east coast was the original harbour for the island. Looking out from the northern tunnel in the Creux de Derrible. The conclusion of the circumnavigation is only another few hundred metres. Mervyn Peake is probably best known for his Gormenghast Trilogy of books but he also wrote Mr Pye, which is set on the Isle of Sark. It was turned in a mini series for TV in 1986 with Derek Jacobi in the lead role. In one memorable section Miss George is lowered into the Creux but the planned picnic was ruined by the arrival of a badly decomposed whale. There were no sea mammals to distract us and it was too early for our picnic, as we entered the bay, but Derrible Bay is a great place to explore, either by kayak or on foot. Mr Pye was first published in 1953 and in the subsequent half century plus this quiet corner on the east coast of Sark has remained virtually unchanged and as we explored the bay on a warm July Sunday morning it was possible to imagine the events unfolding, as described in the book. There is a clear relationship between Sark and Mr Pye, so any kayakers who are fortunate enough to be able to be able to paddle to this delightful island should endeavour to read the book by Mervyn Peake, prior to their visit. 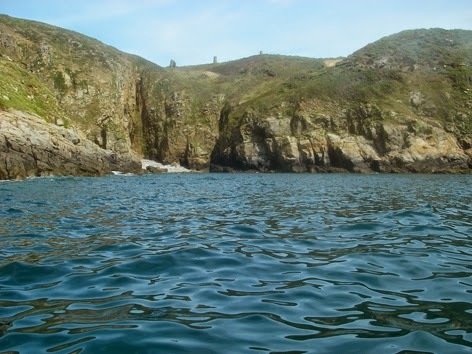 For the sea kayaker interested in literature Sark has other connections including the Victor Hugo cave on the west side of the island. Derrible Bay, viewed from above. 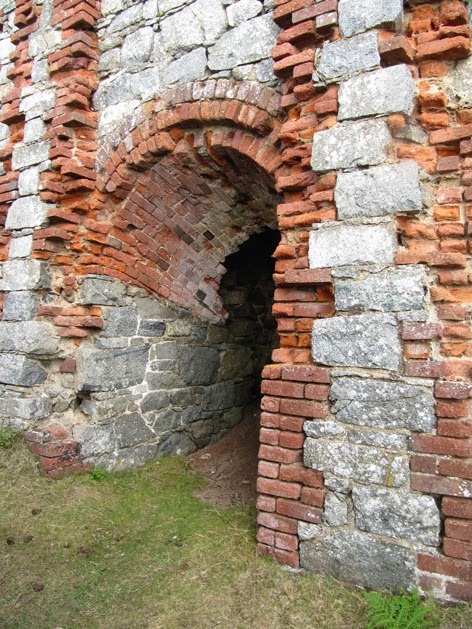 The Creux is on the left hand side of the photograph. Chris crossing Derrible Bay, whilst undertaking a circumnavigation of the island. Entering Creux de Derrible, at low water this entrance is dry. The Victor Hugo Cave on the west coast of Sark. 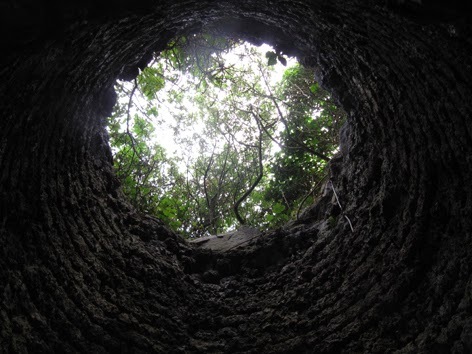 Looking out towards the entrance of the Victor Hugo Cave.